Welcome to the Crosspoint Wireless Doorbell Review! Here you will find everything that you need to know about the Crosspoint, including the best uses for this wireless doorbell. You will also find out about the Crosspoint has multiple add-ons, including a battery-powered, and even a vibrating receiver. As part of our wireless doorbell reviews, we decided to take a look at the Crosspoint to see what it has to offer. You may notice some stark similarities between the Crosspoint and the Sadotech Wireless Doorbell kits. That is because they are manufactured by the same people! The working distance of the Crosspoint doorbell is 500ft/150m in open areas, but you can get more than that if you are using it in a house without many items to interfere with the signal. In open air, the Crosspoint can reach 1000 ft. 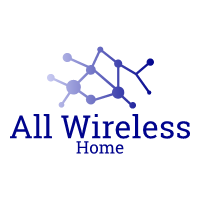 There are a number of things that can interfere with the signal from the wireless doorbell push button, including walls, doors, anything metal, and anything that also uses a wireless signal. It is not the longest range we have seen, with other wireless doorbells capable of reaching over 1300 feet. Although when you consider the size of the average home, we say that 500 ft is more than enough! 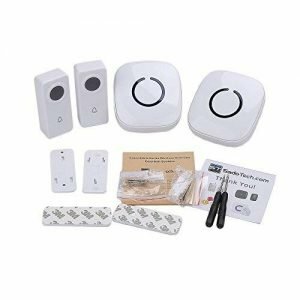 You are able to attach over 20 extra items to the Crosspoint kit, so if you need a wireless doorbell with more than 1 receiver then it is worth considering this as an option. The frequency of the Crosspoint is 433MHZ. Let’s begin with the ringtones. There are 50 different melodies to choose from, which is more than enough for you to choose one that you love! If you would like to choose a different ring tone for different push buttons then that is not a problem either. The volume range is 25dB-110dB which is a good volume for a large house. As there are two receivers with this kit, you can space them out to ensure you hear any visitors. If you need more, then extra receivers are available! 110dB is an excellent volume for a wireless doorbell, however, if you are hard of hearing there are louder wireless doorbells that you will want to consider. Having said that, the Crosspoint wireless doorbell kit has a vibrating receiver as an extra add-on, so if you are hearing impaired then you will know when you have a visitor. In terms of being waterproof, the Crosspoint wireless doorbell is rated IP68 which is one of the highest ratings we have seen. You can be sure that this wireless doorbell will work even in the heaviest rain storms! The working temperature range for the Bodyguard wireless doorbell is 5°F to 140°F (-15°C – 60°C). If you live in a cold climate then there are better wireless doorbell options for you. Having said that, the Crosspoint is rated to work in most climates around the globe. Plug in the receiver and select your desired melody sing the forward and backward buttons. When you have selected your desired melody, simply place the receiver into learning mode by pressing the volume button for 5 seconds. You will hear a pairing alert tone to confirm the receiver is ready. 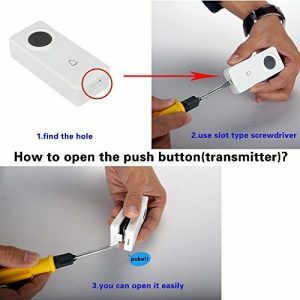 To finalize the pairing process, press the button on the transmitter (push button) within 5 seconds. To unpair the units, simply press the music control forward button for 5 seconds. When you hear the ‘chirp’, the device has entered pairing mode. The receiver has now been cleared of any settings. There is a 12-month warranty with the Crosspoint wireless doorbell, along with a 30-day money back guarantee if you are not happy with the purchase. If you return the doorbell within 30 days, it must not have been used. Any used doorbells that are returned under the money back guarantee will be rejected. During our review of the Crosspoint wireless doorbell, we drew the conclusion that it is a well built, dependable wireless doorbell with awesome potential for various scenarios. The IP rating of IP68 means it is an excellent waterproof wireless doorbell. A vibrating receiver and high volume levels give options for those who are hard of hearing. The expandable solution means you can use it if you need multiple receivers. You can add battery-powered receivers to it if you need a portable wireless doorbell. The door sensors offer extra security for your home. The only drawback is the working temperature range! Have you got a Crosspoint wireless doorbell kit? Do you have any issues with it? If so, please get in touch because we would love to hear from you. The Crosspoint wireless doorbell is an exceptional option for many different scenarios! 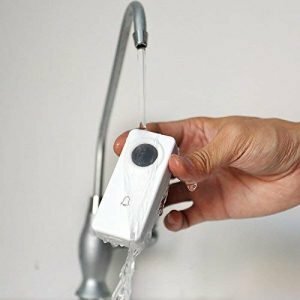 Not only can you expand this kit with up to 30 items (including door sensors, motion sensors, push buttons, receivers, and more), but it has one of the highest waterproof ratings we have seen. The Crosspoint has to be considered if you are looking for a new wireless doorbell!